Explore Rome with our professional driver guide for the ultimate Rome sightseeing tour. This panoramic driving tour of Rome is an overview of Rome’s center and beyond. It is a chance to see beyond what you can reach on foot. See and walk on the ancient Via Appia (except on Sundays) and see the ancient walls and gates of Rome. This private Rome driving tour conducted by our excellent Rome driver-guide will show you Rome’s top sites along with interesting sites and neighborhoods rarely seen by tourists. This Rome tour is especially designed and also customizable to include your desires and unique needs. 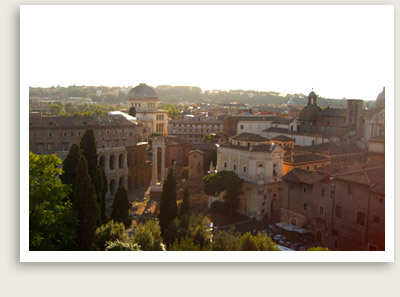 It is a perfect Rome family tour and it is also perfect for kids, seniors and those with mobility issues. Vehicles for the Disabled. Inquire about vehicles with wheelchair access in Rome. Inclusions: Private transportation, services of an excellent driver guide. NOTE: This private Rome driving tour can be fully customized. This comprehensive private panoramic Rome driving tour whisks you through all of the city’s most important neighborhoods and sites, from the ancient to the modern. Your sightseeing tour of Rome starts at a drive at the top of the Spanish Steps square, you quickly reach one of the most famous balconies of Rome, Pincio Terrace. From here you can see above Piazza del Popolo, one of the most elegant squares in Rome, with its obelisk, the Twin Churches, and the famous Trident formed by the three streets converging here: Via del Babbuino, Via del Corso, and Via di Ripetta. Your private Rome driving tour will continue on to Via del Corso, the commercial artery of Rome, full of shops, banks and governments buildings like the Palazzo Chigi, home of the Prime Minister’s office. Here you will see the largest square in Rome, Piazza Venezia. Here you will see Palazzo Venezia, the headquarters of the Fascist party and Mussolini, as well as the Vittoriano, a huge monument dedicated to the first Italian King, Vittorio Emanuele II. Next, your private Rome driving tour will be over the Aventino Hill, from which you can take a photo of the Imperial Palaces located over the Palatine, the oldest hill of Rome. In between Aventine and Palatine in a large depression, you can also glimpse the largest chariot racetrack ever built in the Roman Empire: The Circus Maximus. Your private Rome driving tour will take you along Appian Way toward San Sebastian Gate, passing by the Regina Viarium to reach the Catacombs. Here you can hire a private guide to visit some of the numerous underground tunnels here. After this optional visit, the sightseeing will proceed further along Appian Way, passing by interesting monuments. Depending on your time and interest, you can take a short stroll over the ancient pavement of the Appian Way. On the way back to ancient Rome, your drive will skirt the Aurelian Walls; as well as the second largest Roman bath, Terme di Caracalla. Used in summer as an opera open theatre, Terme di Caracalla was made famous by Pavarotti when he and his costars of the “Three Tenors” played their first concert. Continuing the drive along the city walls, you will approach a large square, where you can photograph the Rome Pyramid, located next to St. Paul’s gate. At this point your Rome guide can take you to a trattoria to sample some fine Roman cuisine. After lunch your private Rome tour will take you up the Capitoline hill from which you will be able to see the Roman Forum. From this point you will cross the pedestrian square in front of Palazzo Senatorio, home of City Hall, whose façade and staircase was designed by Michelangelo. 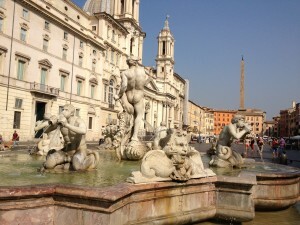 The last stops of this Rome private tour are the squares of Baroque Rome, starting from Navona Square. You will be dropped off near the entrance of the elliptical square, built over the ruins of the ancient Domitian Stadium. Here you will see one of Bernini’s most celebrated works: the Four Rivers Fountain, representing the four most important rivers known in the 17th century. Then you will be driven through a maze of narrow streets among the Campo Marzio, meaning “Fields of Mars.” An ancient Roman district, this area boasts many important historical structures, like the Pantheon, dating back to the 2nd century AD. Your driving guide will drop you at the side of this astonishing monument, where you can gain a better perspective on the incredible dome topping the building. Next stop you will reach the enchanting fountain square, home to the renowned Trevi Fountain, where you can toss a coin for good luck. Finally, on the way back downtown, your driving guide can drop you at the Spanish Steps square to enjoy some of the best shopping in town. You can also be dropped off at your hotel or apartment in Rome.